Tranmere Manager Gary Brabin has tonight made his eighth signing of the summer by adding striker Andy Mangan to his Rovers squad ahead of the Vanarama National League campaign beginning in early August. The 28 year-old striker whose former clubs include Wrexham, Fleetwood Town and Shrewsbury has signed a one-year deal at Prenton Park and joins James Norwood in adding to the striking options for Tranmere ahead of the new season. 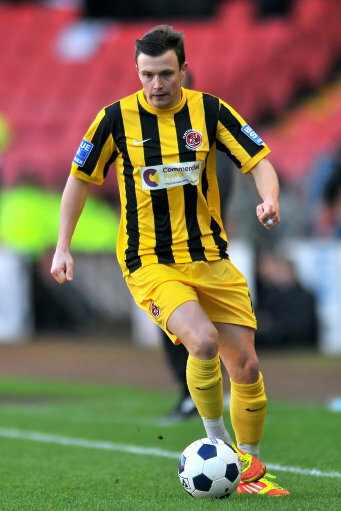 After beginning his career as a trainee at Blackpool but making no appearances in the first team for the Seasiders, Mangan moved to Accrington Stanley where he scored 10 goals in 15 starts over a two year spell including helping Stanley to the Conference title in his first season at the Club. A move to Bury followed where in his one season at Gigg Lane he scored 5 goals in 8 starts. After a return to Accrington on loan which yielded 1 goal in 3 starts, spells at Forest Green, Wrexham and Fleetwood followed in which in total he scored 73 goals in 147 appearances for the three Clubs and once again won a Conference title, this time with Fleetwood Town. Finally, after a 12 month return to Forest Green, Mangan signed for Shrewsbury last summer and scored 10 goals in just 12 starts as Shrewsbury won automatic promotion back to League One at the first attempt. Notable goals last season for the Shrews included League Cup goals against Premier League sides Leicester City and Chelsea. Total Tranmere would like to welcome Andy to Tranmere and we look forward to seeing him action for the Club. Could be our best signing so far? Bet there were loads of clubs interested in him, great work by all concerned. Got to fancy our chances now. The best signing of the summer for me! His goals to starts ratio is good but in a lot of cases he hasn't played too many games each season - injuries maybe? Woo hoo! Another good signing. Right age and right experience, yet again. I'm starting to get really excited for our chances. Well this does seem like a turning point for the Forum! Is there anyone out there who isn't happy?!! Great signing and he's scored against Premier league teams, so national league teams should be a doddle to beat . A added bonus is that he and james norward have played together for at least a season before. what a great acquisition and signing. reckon he could have easily found a league club for the season ahead. we still have the pulling power. being a local lad might have helped. confident that he will be bagging a load of goals. Fits the player recruitment criteria, three promotions to his name, England C cap, local lad, can score goals and has a betting scandal against his name. He's a perfect fit! Didn't see this signing coming, but it is an excellent addition to the playing squad and certainly a statement of our intent to come back stronger. Edited 1 time(s). Last edit at 2015:07:03:06:58:39 by The Silent Knight. 2 promotions from this division, great signing, keep em coming !!!! Alls we need now is a couple of wide players an maybe another centre mid an il satisfied we can compete for the title!!! It gets better by the day. This could be the icing on the cake. Fantastic signing. My only question is why he was not snapped up by a some of the bigger fish. His goal scoring ratio is better than most. I think that we must have offered him a pretty good deal and staying locally may have also helped. Last season we had strikers who couldn't strike,now we have two proven strikers. Can't wait to see them in tandem. "Give it to them mangan style "
Let's be honest, defenders that couldn't defend didn't help either. Let's face it the whole team for the last two years we're basically c*ap. Turns out there's been a slight mistake. The club haven't signed Andy Mangan, the club have got Stephen Mangan and he's doing the next comedy night with a few quips / anecdotes and a rare performance of one his old Aragorn songs. So don't be surprised if his attempts to portray a striker, don't stack up to his attempt to portray Tony Blair.